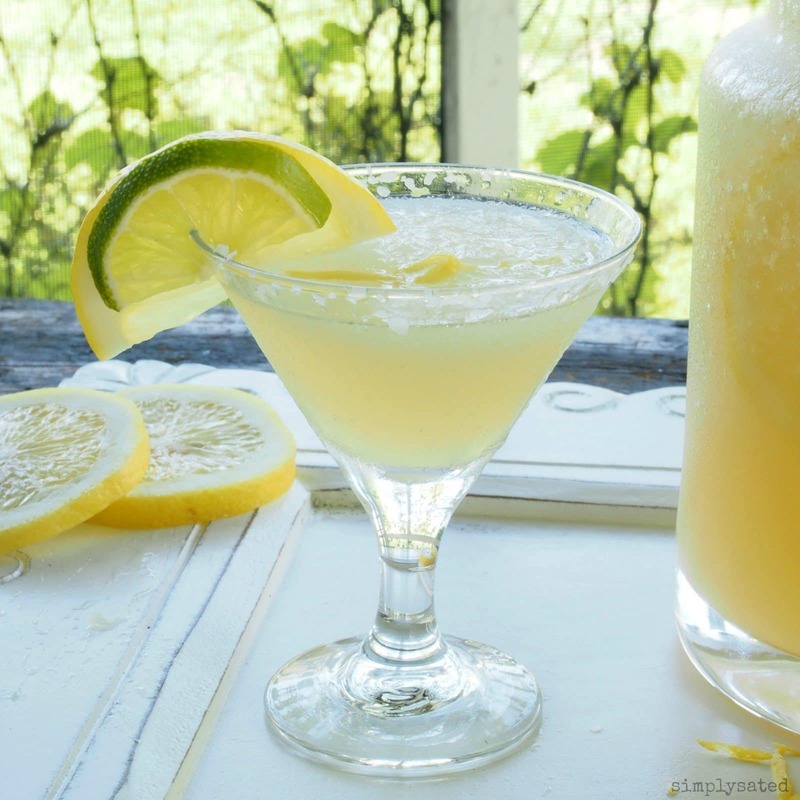 Limoncello Margarita is pure sunshine in a glass. The color, the aroma, the taste come together perfectly to create this gorgeous cocktail. I have been lemon-longing for months now and no matter how many lemons life gives me, my desire goes unsatisfied. We all go through food-craving phases and I am in the middle of unshakable lemon-yearnings. One of my favorite lemon chicken recipes is The Cookie Rookie’s Lemon Balsamic Roast Chicken. It is delicious and healthy, so be sure to check it out. I am serving that for supper tonight and cannot wait. Yum!! Maybe I should create a lemon smorgasbord – maybe that would quench my lemon desires. I could serve Lemon Tea, Salad with Lemon Vinaigrette, Lemon Asparagus, Lemon Chicken, Lemon Bars and top it all off with Limoncello Margaritas. Before I go, here is a sliver of info I learned about Limoncello: Limoncello is a lemon-flavored liqueur traditionally made from the zest of lemons found in Southern Italy. The zest is soaked in concentrated ethanol (whaaat?) until the zest oil is released and then, the zest-infused liquid is combined with simple syrup. That all sounds simple and interesting enough. I do have a desire to make my own limoncello, but that little experiment will have to wait for another day. I need to get busy on that smorgasbord! 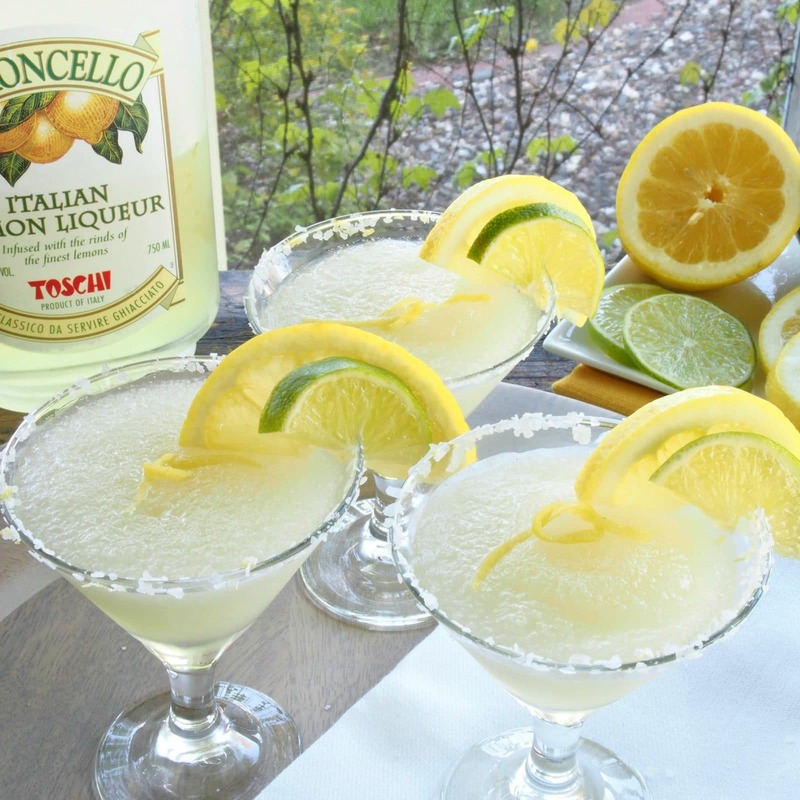 Limoncello Margarita is sweet, sour and refreshing. Combine coarse sugar, margarita salt & lemon zest in a shallow bowl. Rub the rim of a cocktail glass with 1/2 slice of lemon. Turn the lemon-rubbed glass upside down and dip the rim into the salt mixture. Set the glass upright to let dry a couple of minutes. Pour crushed ice into a cocktail shaker. Pour all drink ingredients over the ice, tightly cover and shake 30 seconds. Pour into prepared glasses. *See note. If using a metal cocktail shaker, wrap a cloth around it before shaking. The metal gets extremely cold and this keeps any liquid from seeping out. *Limoncello Margaritas can be made up to 1 month before serving. 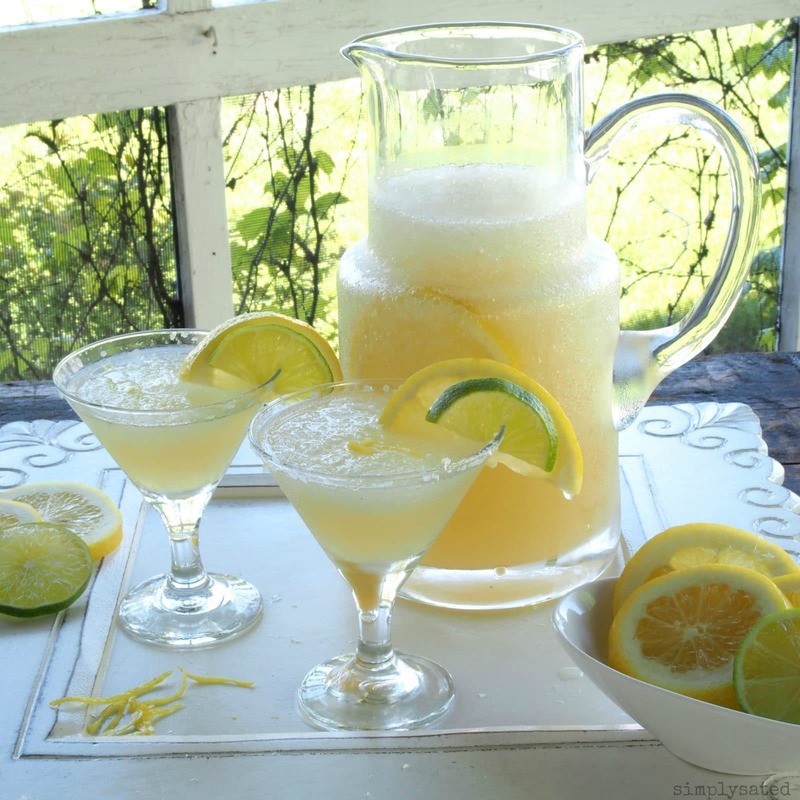 Pour margaritas in a freezer container, cover tightly and freeze. When ready to serve, remove from freezer 15-20 minutes before serving. Wow, these look amazing! Beautiful pics and such a great flavor idea!!! What a beautiful and sunny summer cocktail! So refreshing and what a great drink that could be served for a summer evening cocktail party! Love these! Thanks Linda and thanks for stopping by to comment. One cannot have too many lemons:-) It is lemonade time!! These look delightful! I am picking up ingredients tonight! Hello Susie G, it's good to hear from you! 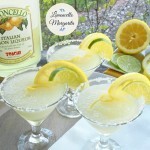 Thanks so much for visiting Simply Sated and let me know what you think of the Limoncello Margarita. These look slushy. How did you accomplish that? Crushed ice or can I make ahead and put in freezer?